Vitamins are organic compounds that are necessary for important biological functions but that the human body is generally unable to synthesize. Vitamin deficiencies can manifest in various body systems, but are most evident when they affect the skin. It is important to recognize changes in the skin in order to properly address the underlying problem. Vitamin C is an antioxidant and essential for many biologic functions, specifically collagen synthesis. Thus, vitamin C deficiency, also called scurvy, can manifest as loss of integrity in collagen-containing tissues such as the skin. Skin manifestations of scurvy include bruises and corkscrewing of hairs with bleeding from hair follicles. Niacin is a B-vitamin that is primarily involved in energy production. 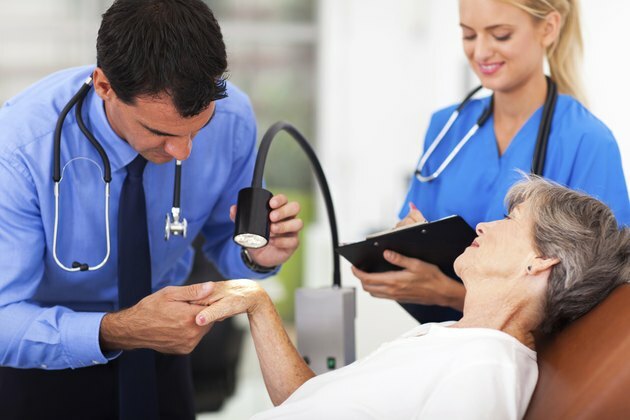 Niacin deficiency, also known as pellagra, has characteristic skin changes described as photosensitive inflammation of the skin that is red, painful and itchy. With time, it becomes swollen and blisters develop. Once the blisters burst, the skin becomes crusted with brown scales. The skin eventually becomes thick and hyperpigmented. The backsides of the hands are most commonly affected. Vitamin A is a fat-soluble vitamin, meaning it is stored in the body, and is necessary for proper keratinization of the skin. The skin findings associated with vitamin A deficiency are dryness, itching, and scaling. Severe deficiency can cause deep skin cracks and fissures. Vitamin K is necessary for production of blood coagulation factors; deficiency can lead to abnormalities in blood clotting which can manifest as abnormal bruising of the skin. Riboflavin is another of the energy-producing B-vitamins. Deficiency causes inflammation of the skin particularly in the nasal area, forehead, cheeks, and behind the ears. It can also affect the inside of the elbows and backs of the knees. It affects the genital region more severely in men than women. Vitamin B6 deficiency presents as skin lesions on the face, scalp, neck, shoulders, buttocks, and perineum. The lesions are flaky, white, and oily. There may also be skin lesions present similar to those seen in niacin deficiency as B6 is necessary for production of niacin. Vitamin B 12 deficiency can cause hair depigmentation, and skin hyperpigmentation. The most affected areas are the hands, nails, and face. Though biotin deficiency is extremely rare, it can cause skin redness, scaling and crusting dermatitis that starts around the eyes, nose, and mouth and proceeds to affect other areas of skin surrounding orifices. "Fitzpatrick's Color Atlas and Synopsis of Clinical Dermatology"; Klaus Wolff, Richard Allen Johnson; 2009. "Fitzpatrick's Dermatology in General Medicine, Ch. 130"; Melinda Jen, M.D., Kara N. Shah, M.D., Ph.D., FAAP, Albert C. Yan, M.D. ; 2008.